Summary: Honor receives her brother’s last letter from Iraq three days after learning that he died, and opens it the day his fellow Marines lay the flag over his casket. Its contents are a complete shock: concert tickets to see Kyra Kelly, her favorite pop star and Finn’s celebrity crush. In his letter, he jokingly charged Honor with the task of telling Kyra Kelly that he was in love with her. My Thoughts: Road trip with a hot guy? YES PLEASE. Honor is a cool girl. I liked her. I thought she was neat. Honor loses her brother Finn in combat. She’s just not the same after that. They were close. Best friends. Nothing can replace him. She’s going through the grieving process. They have his funeral and a while later she gets a letter from him. It must have been one he wrote before the accident happened. Inside is a letter telling her to follow her dreams and to go see her favorite singer Kyra Kelly and tell her about Finn being in love with her. Honor has followed Kyra’s career from the beginning. He sent her two tickets. So, she does the only thing she knows how. She listens to her brother. She gets in the car he left her instead of driving off to college. She heads to California from Texas to see Kyra perform. But right in tow is Finn’s best friend Rusty. He happens to be in the right place at the right time and goes on the road trip with Honor. I liked their banter. They had been best friends for years as well until Rusty and Finn got into a fight and stopped talking. They both had full rides to college but instead Finn chose the Marines. At times things get pretty awkward between Rusty and Honor. But its also very interesting too. You can tell they both feel things for each other that are more than friendship. They see each other in another light. They have a few stops along the way and I enjoyed seeing these events happen. They were enlightening and just what Honor really needed. I thought this one was a well written novel. It was cute, but also had a deeper meaning. 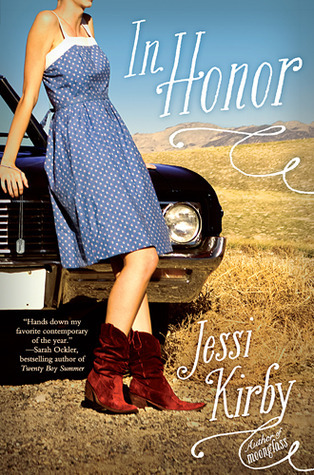 I liked both Rusty and Honor and I liked they way they could relate to one another. It was a wonderful novel! A nice contemporary! Overall: Loved it! Loved the characters, loved the road trip even if it was for crappy reasons, and I loved the way things ended. It felt right. Cover: Love it! Also love the back of the cover as well, where we can see the guy! Very cute!